By lavender at Aug. 2. 2014. We will be looking at some plants from our gardens over the next couple of months. Plants that are growing well are unusual or are just of interest. If you have anything relevant please let us know. We’d love to have something from each member’s garden. The first is the foxtail lily (Eremurus spp. ). This one is from Sharon’s garden. She also provided the picture. There are 9 different species of Eremurus and with hybrids about 35 to 40 different varieties. Flower colors range from white, through pinks, reds, yellows and oranges with varying shades in between. Heights range from 2 ft. to 10 ft. Sharon has a pink flowering variety and, while there is some confusion as to the parentage of various hybrids, most of the pink ones seem to be either Eremurus robustus or hybrids or some sort. Robustus grows 6-10 feet tall with leaves up to 48 inches. The flowers are pale to deep pink, in an inflorescence that can contain 700-800 flowers. The flowers have a dark blotch at the base and two green petals at the bottom of the flower. ‘Sheffield Pink’ is a smaller hybrid at 4-6 feet that is designated E. x isabellinus. The term includes a number of plants, which according to the Missouri Botanical Gardens, are hybrids of E. olgae and E. stenophyllus. They include the Ruiter and Shelford hybrids that are most popular of the foxtail lilies. There may be a couple of other pink hybrids but these seem to be the plants that are most readily available commercially. Eremurus is a member of the lily family but it grows from a starfish shaped tuber rather than a true bulb. While their common name foxtail lily is based on the shape of the flower, their alternate name desert candle gives a clue to cultural requirements. These plants come from sunny, dry regions of Turkey, Iran and Afghanistan. They grow best in full sun but will grow in some shade. Plants with less than full sun will frequently need staking as the tall flower stems will not be as sturdy. Foxtail lilies need excellent drainage or the tubers will rot. They are not fussy about soil types but it is suggested that the planting holes be amended with compost or gravel to improve drainage in heavy soils. Gravel also makes good mulch, as it keeps puddles from forming. Suggested technique for heavy soils is to dig a hole 5 inches deep and a foot or so across. Build a mound of compost and sand and place the tuber on top with the “arms” pointing downward. Back fill with a combination of compost, sand and soil. Growing plants and freshly planted tubers need about an inch of water per week. One good watering is probably better than numerous light sprinkles. The tubers are planted in the fall and most of the root growth occurs then. 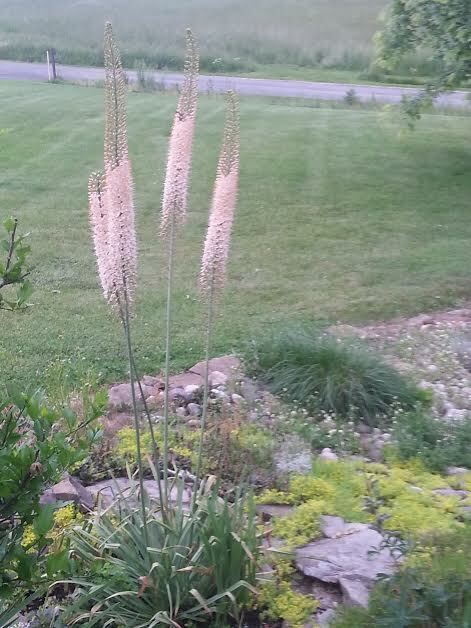 The foxtail lily is hardy to zone 5, with some species being hardy to zone 3, but they will benefit from winter mulch. Use mulch that will drain well. Anything that retains water may cause rotting. In the spring the rosettes of leaves emerge. They are prone to damage by late frosts so should be protected for maximum sized plants. The frosted plants will still produce flowers but plant and flower size may suffer. The flower stems appear, one from each rosette, in late May or early June. The flowers are fairly long lasting, especially if the plants are in a protected location where they are not subject to winds. The plants will reseed if in a site that suits them, although there is not telling what you will get from the seedlings if the parent plant is a hybrid. Dividing the plant is possible but the roots do not like to be disturbed. It is best to choose a location where they can remain without overcrowding. Sharon did tell us that it took years for her fox tail lily to bloom. The plant themselves do take a long time to establish and won’t bloom until they have made themselves at home. They also need a good chilling before they will bloom. Perhaps those -20 degree temperatures that we had this winter actually did something good.